Look’n Good and Sound’n Better - Headsets Direct, Inc. Introducing the Stylish new Plantronics Discovery 925 Blue tooth Cellular Headset! Whether you like Black, Gold or Pink you are sure to look your best and sound even better when you put on your new Discovery 925. 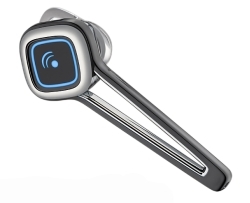 With a VFrame Design for comfort and Audio IQ for noise control you can’t go wrong with this blue tooth. It even comes with a rechargeable, color coordinated case. It is the perfect size for your purse or briefcase and will keep charge up to 5 hours of talk time or 7 days on standby. If you have steered away from purchasing a blue tooth in the past because of comfort, look no further. You will have 3 sizes of self-stabilizing ear tips that you can custom fit yourself, and you will no longer need an ear loop.